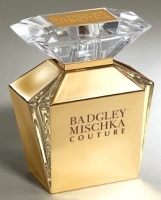 Badgley Mischka will celebrate the 20th anniversary of their brand next year with the launch of Couture, a new fragrance for women, in February. The woody floriental perfume was developed by perfumer Caroline Sabas; the notes include purple plum, blackberry, pear nectar, jasmine, gardenia, violet, white patchouli, black vetiver and sensual musk. Hurrah for plum, blackberry and pear nectar! Though the golden bottle looks a bit tacky to me. Well, as a loyal reader, I think you're usually very nice about your crankiness, so you're forgiven, lol. I didn't love the other Badgley Mischkas either, but when I see plum and violet in the same scent…gonna have to give this a sniff. I like the bottle, and the notes sound very nice! I like seeing it listed that way, because then at least I know. The simple fact is that it's rare to smell unmodified patch these days, and I'd just as soon have them tell me in advance. I love the bottle, I guess that makes me tacky (hang on a second, one of my three inch stick on nails just popped off) There we go. Now, back to the scent. Robin you seem to have great taste. Did you try it? I think the notes sound rather nice. However the last Badgley Mischka had zero lasting power on me. What's the verdict? LOVED The other two Badg-Misch Fragrances. The Original was almost like one of those big overblown drown everyone in the elevator type of scents from the '80's that always gets my blood roiling! i think it was very well done and modern enough to not reek like Giorgio or Charlie or something like that! I though the Original was Very Glam and Very Beautiful and Rich! the Fleurs de Nuit flanker was RADIANTLY feminine and creamy and floral in a modern way for an ADULT woman not a GIRL! (hate GIRLY SCENTS!) and i adore the bottles… they're Gaudy and Ostentatious and Definitely “LOOK AT ME” compared to other bottles on the perfume Counter. Anyway, no, haven't tried it, it doesn't launch until next February and Badgley Mischka is not likely to send me a sample. I still have not dragged myself to the mall to try B de Boucheron — must do that this week! I am such the utter Sucker/Crazed Fool for ANY fragrance with Osmanthus in it (Or Lotus, why isn't Lotus used much anymore? there was a L'occitane Fragrance called Lotus Blossom that i only got to smell once and fell head over heels for and cannot find it anywhere now! Sad!) and also thats one reason i loved the original Badg-Misch Fragrance, it had Osmanthus in it. So for me B de Boucheron was a natural love affair! I think you will like it though, it is a little spicier than i thought it would be and the dry down to me is more woody than floral, but it is very feminine and i wouldn't hesitate to also say Graceful! But now i am dreaming of a fragrance that combines Osmanthus, Lotus, Madagascar Vanilla Orchid, White Nectarine, Fleur De Pamplemousse, Apricot, Water Hyacinth, Water Lily, Damascus Rose and Blonde Atlas Cedar with a Soupcon of Labdanum! I think it would be named…. Insouciance! you like? I love osmanthus too — and perfect name! I just got a sample of this. I like the first one so I was pretty curious. I opens like a *much* lighter version of the opening of White Patchouli (Tom Ford). The middle (the best part) is a much softer and way less sweet version of the middle in the original BM, which is basicallya good thing. The dry down is a very soft fruity woody amber, again, much softer version of the original. At the very bottom it picks up a *very* light soapy note. The opening takes about 10 minutes to change, so don't be put off by the business clean patchouli stuff. It is pretty but in a rather cleaned up simple way. It doesn't exude glamour as you would expect from the copy. I'm not sure for me this is FBW, but it speaks to me as a non-offensive frag for business meetings or women who are just trying to get out there with a new frag and don't normally like richer or heavier frags, or can't really wear the original. The right man could wear this if he really wanted to get into a woman's frag, b/c it does have a nice light woodsy fruit thing going on, and it's not really sweet in the heart notes. I think it would actually smell really good on a man, and guys could just pretend the bottle belonged to an X. That does sound nice. The first one was really too strong for me, I'll need to give this one a shot. I loved this at first, then realized it was because it smelled like Black Orchid without the truffle. It dried down to smell like Dune. Odd. But not terrible. I accidentally hit “post” on this before I was done, but you get the picture. To sum up: it’s a nice fragrance, but not all that original. I agree that it could be a good masculine…maybe I’ll pass it on to my partner. I have a sample but still haven’t tried it…must get on the ball! Robin, did you get to sampling this yet? What did you think? I didnt find it masculine at all what w/ all the fruit in the top notes. Ack. I admit this one is languishing. I will try to get to it!